The construction documents shall have specific listed product and all pertinent manufacturer’s specification sheets, documentation and drawings for each type and size penetration. Further, the architect shall also specify on the construction drawings where penetrations of rated walls and floor are located and note the design being used to restore each of the penetration. The architect shall specify the size of the opening for each penetration as it regards the annular space limits of the specific design being used. All penetrations shall be perpendicular to the penetrated surface unless a specific design for non-perpendicular penetrating items is provided and used. The contractor will demonstrate to the Fire District, through on site inspections, that the proper application has been done. The Fire District during inspections will have the right to disassemble a completed fire-stopped assembly to assure code compliance. 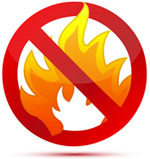 All materials used in fire-stopping shall be listed for and be used as a component of an approved design and shall be used exactly as specified by the design. Additional requirements can be found in Chapter 7 of the International Building Code, 2018 Edition. Once a specific method and/or materials have been approved it shall be used, as approved, unless the architect submits a design change and that documentation is approved by the Fire District.